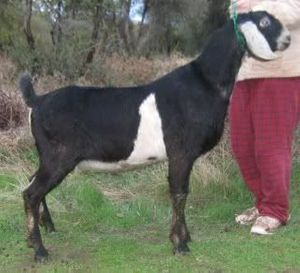 'Alfalfa' was sold to a local family as a kid to breed to their grade dairy goats. We are excited to have him back! He is a long, tall boy, and true to most Shiyloh sons, he has spots. 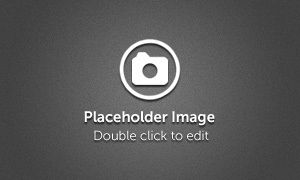 He is passing those onto some of his kids, but more importantly he is passing on long bodies, style, width between the hocks, and openness in the escutcheon. 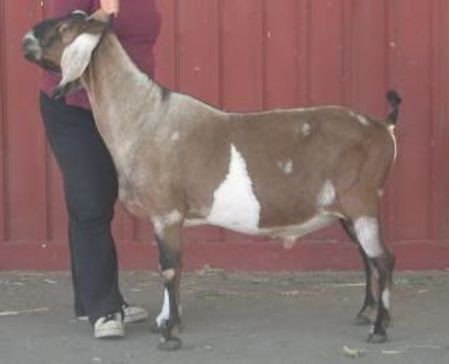 He has shown very well- earning 1 grand and three reserves at his only show in 2013. We like his daughters so far and are looking forward to seeing them with a second year in milk. 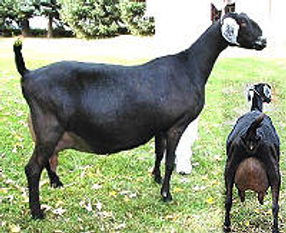 Pictured are Alfalfa as a 3 yo, yearling daughter, Aja-Sammati RSK Kricket (now residing at The Ugly Goat Milk Company in CO), and rear udder of yearling daughter Aja-Sammati Mambo No. 5. We thank C&W Farm for the opportunity to use Anakin on a couple of our does for 2015 kids. 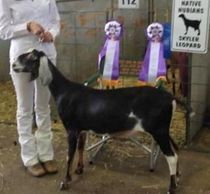 Though he has been stingy with doe kids so far for Joanne, we admire his maternal 1/2 sisters and the does we have seen from his litter-mate brother, Obi-Wan Kenobi at Tamris Farm. 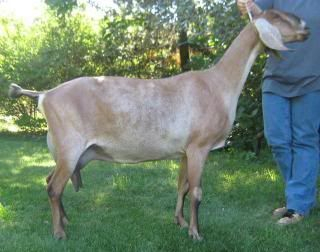 I am grateful to Tim Pruitt of Pruittville Nubians for the opportunity to own this very correct buck. He is incredibly wide and level from thurl to thurl, level across the topline, and wide overall. His dam's udder is incredible, with an amazing fore udder. Erebh is mix of some of our favorite Nubian bloodlines. He is a very long buck with a very wide rump that is level from thurl to thurl. He is angular, stretchy, has a long elegant neck...he is a real pleasure to look at! 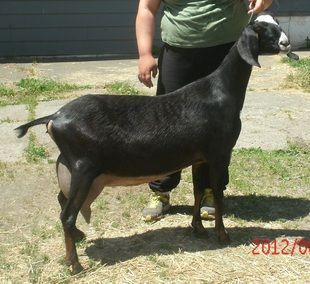 We really admire the milk production of his dam as a first freshener, and his daughters are very promising. A huge thanks to Paula Chartock for leasing Rio to us this year. We really like the stylish young daughters we have seen, his stellar pedigree, and the correctness and depth we see in him as only a yearling buck. We love the kids we have had born here and have retained one from every breeding to freshen! Press was here for a limited time, on lease from our wonderful and supportive friends, Sandy & Leroy Riehle of Deer Park, Washington. The offer to use Press was thrilling! His daughters are exceptional, with lots of size and beautiful mammary systems. 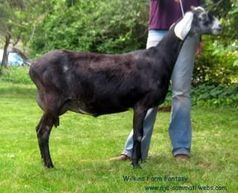 Zach's daughters are strong, with improvement in feet and legs over their dams and no loss of dairyness. They are sharp into the withers, with clean legs. They are extremely productive does. We were very excited to have the opportunity to use 'Avatar'. His kids are very correct, have long bodies & legs and lots of style. 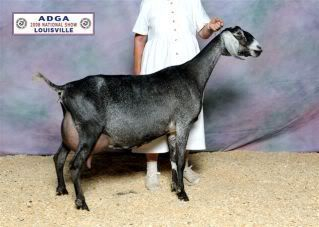 His dam, Aurora, throws very consistent daughters, such as GCH Pella's Triple C Yahtzee 2*M, and his sire, Laredo, was the 2009 ADGA National Premier Sire. 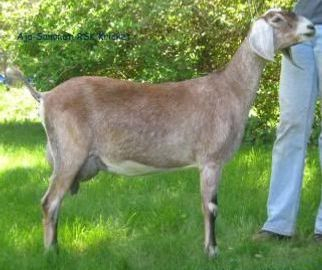 Patriot is the sire of the 3rd Place 2 year-old milker at the 2009 National Show, GCH Pella's Triple C Yahtzee 2*M. He is a wide, long buck, passing on style, strength, and correctness to his daughters and sons. His litter-mate sister, SGCH Kastdemur's FS Santa Cruz 10*M has appraised 92 EEEE and has been on the Top Ten list in all three categories.